Virus removal, Crash solutions, Software and hardware problem solving, Data recovery, Anti virus and PC Cleaner installation. Upgrades, PC repairs, Laptop repairs, All in one and Apple Mac repairs, Servicing, IT Maintenance, Remote access, Broken screen replacement. We provide support for all Windows operating systems and all Mac OS X versions. 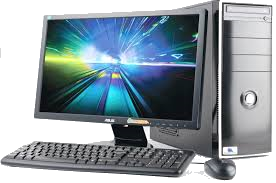 We can supply PCs, Laptops, All in one PCs, Memory, DVD Drives, Hard Drives, Scanners, Power supplies, Modems, Wireless routers, Wireless cards, Graphics cards, TFT Monitors, Webcams, Mice, Keyboards, Case fans, Printers (Inkjet, laser, all in one), Smart switches, Network storage drives. Internet setup and problem solving, Broadband, Wireless, BT, Sky, EE, Talktalk, Virgin, Utility Warehouse etc. E-mail setup. Networking solutions, Link PCs, Laptops and Tablets for Internet, file and printer sharing.